by zecqi of Re-Versing Verses – click Comment to read or add comments at Zecqi’s site. The book of 1 Peter was written by Peter to the Christians at a time of immense suffering and persecution. It’s pretty much a letter that was meant to comfort his fellow brothers and sisters in Christ, at the same time to encourage and affirm them to be steadfast in their faith. He wrote this letter to every Christian. To all of God’s elect – not some of them, not only the ones who were suffering. Perhaps at that time, in the early Church days, persecution was happening – at varying degrees – everywhere. Everyone was suffering when they walked into this faith whether they expected to or not. Today we may live without the persecution of the society for our faith. We may be unable to see the sufferings of another Christian from the outside; we may feel that there are some of us who do not suffer at all. We may have come to expect not to suffer, and as a result, when we suffer, we are surprised and we feel wronged. Peter questions the Christians – is it strange to suffer? Why are you surprised when you suffer? In today’s study, we will adopt Peter’s take on suffering and expand it to see why we are surprised when we suffer. Do not be surprised at the painful trial you are suffering – when are humans surprised? They are surprised when what happens is something different or far from what they had expected. What, then, are the expectations of us as Christians that would cause us surprise when we suffer painful trials? I can think of a few, speculatively, and there are probably many more, but let us tackle these scenarios one by one. 1. You expect a good, blessed life in Christ after receiving Jesus as your Lord and saviour. There’s nothing wrong in this expectation if your definition of a good, blessed life coincides with that of the Bible. Did Paul lead a good, blessed life? It’s hard to say he didn’t – near the end of his life he exclaimed himself that he had fought the good fight, finished the race and kept the faith [2 Tim 4:7]. He was thankful for the protection and immense blessing that the Lord had given him over the years [2 Tim 4:17]. He had mentored so many leaders, raised so many churches, kept pushing on as one of the first missionaries in history – it is very difficult to say that his life wasn’t good and blessed, except for the fact this: Five times I received from the Jews the forty lashes minus one. Three times I was beaten with rods, once I was pelted with stones, three times I was shipwrecked, I spent a night and a day in the open sea, I have been constantly on the move. I have been in danger from rivers, in danger from bandits, in danger from my fellow Jews, in danger from Gentiles; in danger in the city, in danger in the country, in danger at sea; and in danger from false believers. I have labored and toiled and have often gone without sleep; I have known hunger and thirst and have often gone without food; I have been cold and naked. Besides everything else, I face daily the pressure of my concern for all the churches [2 Cor 11:24-28] He was persecuted all his Christian life, rejected by non-Christians and Christians alike, and for several times he was near-death. Eventually, how did he died? He was crucified – martyred for the kingdom of God. Sure, it was a good and blessed life, but also a painful and suffering life. They are not mutually exclusive. Christianity isn’t the immunity pill to all bad things. 2. You expect your righteousness to pay off, you expect God’s protection. You may not expect a good and easy life, but major sufferings come to you as a shock. Why you? Why not that man who committed adultery? Why not that family of liars? It is difficult to understand God’s justice even as Christians. It is difficult to understand it especially if we are not able to think in terms of eternal life. When we hold our problems too closely to our hearts, they become bigger than they actually are. Why did Job suffer, even though he was so righteous – even called the most righteous in all the earth; and why did so many worse men not? Why, the extent of his suffering was so great that his friends had no doubt that he must have done some heinous sins to provoke the wrath of God – but did he really? Is it fair? If we always limit ourselves in a mental paradigm that the good will be rewarded and protected from suffering; we will never truly experience the greatness of our Lord. Peter questions why we find suffering as a strange occurrence; Paul lists persecution as a fact – In fact, everyone who wants to live a godly life in Christ Jesus will be persecuted [2 Tim 3:12]. 3. You expect trials and hardships, but you also expect that they will be less painful and easier to cope with through the strength of the Lord. Again, there’s nothing wrong with this line of thought except in definition. This is probably how many Christians think these days, which is gratifying. A lot of Christians today believe that God will never give them more than what they can handle – most commonly a concept taken through 1 Corinthians 10:13, although quite often a concept that has been criticized to be taking the verse out of context – No temptation has overtaken you except what is common to mankind. And God is faithful; he will not let you be tempted beyond what you can bear.But when you are tempted, he will also provide a way out so that you can endure it – I do agree with the fact that 1 Corinthians 10:13 isn’t talking specifically on suffering, and in multitudes of verses on suffering in the Bible, this idea was never explicitly stated. But I do not disagree with applying this idea to suffering, and as of now I still do not find evidences in the Bible that states that there are suffering given to us that we have no way out of. There are two main types of suffering – problems of pains (natural evil) and problems of evil (moral evil). I believe temptations are a subset of moral evil, which is a form of suffering, though not all sufferings are temptations. I believe perhaps that the idea that God will never give us more than what we can take can be more precisely stated as God will never give us a situation that he cannot bring us out from – be it suffering or temptation or whatever you want to call it. In essence, we are never strong enough to deal with our trials – but drawing on the strength of the Lord, we can overcome. Many trials will seem overwhelming to you and you may cry that you cannot cope, and you may question God – why did you give me such a huge burden when I cannot cope with it? It’s not that you can cope with it through your own strength – we can never. What 1 Cor 10:13 promises us is not that. What it promises us is that whenever we feel helpless and weak, and not strong enough to cope with our temptations, we can be assured that God will empower us and strengthen us, and through Him we can overcome. Have you ever been horrified by your suffering? Have you ever asked God, why is it so unfair? Have you ever pondered, why me and not him? Why me, when I did so much good and have done so much for your Kingdom? If so, you too have been surprised by your suffering as though something strange is happening to you. It sounds scary when we say that all who leads a godly life in Christ will suffer and be persecuted. Who would want to be a Christian, then? It’s not that scary if we understand our Lord. It’s not all that scary when we know the word enough. It’s no longer unjust or unfair when we are able to look at things from a greater perspective and understand the concept of eternal life. Expect to suffer, so that you will not be surprised when sufferings come. Expect to suffer, but also be assured that God is with you through your sufferings, and he will deliver you. Through him, you will overcome, no matter how mind-blowing your suffering may seem to be. At the same time, expect to be blessed. Sufferings and blessings are not mutually-exclusive. Not in a Christian way of life. In Ephesians 5, Paul continues to urge the church of Ephesus to walk in a manner that is worthy of the calling that they have received [Eph 4:1] – and in today’s study, we’ll zoom in on the importance of walking in wisdom by using our time wisely. God may be timeless, but time is an important concept to mankind – all humans live within the fixed paradigm of time, and we as Christians believe that we live on borrowed time – we do not know when our time on this earth will come to pass, and yet we do not deserve the grace given us that has allowed for us to live on till today – and hence the idea of borrowed time. Since this time is borrowed, let us make good use of it, because it won’t last forever. making the most of every opportunity – One of the more poignant stories that one of my pastors remembers dearly is how his eldest son, as a foreign student in America, made a friend whom he felt he should share the gospel with strongly. However, he allowed himself excuses and he kept stalling, thinking, next week, after I submit my assignment. Next week, after I finish my quiz. Next month, after I finish my exams. Before he knew it, it was summer, and he returned home to his country, resolving to share the gospel with her the first thing next semester. The new semester came, and he was truly resolved to talk to her about God, but he couldn’t find her. Days passed, and he learnt that she had died over the summer break. He had the opportunity, but it passed by him. What he lost was not just a friend, but the salvation of a friend he cared about. It’s a common story. You and I may have gone through similar episodes. Paul speaks of opportunities – and there are indeed many around us, waiting for us to discover them. We are often not sensitive to the doors of opportunities that are around us. What are these opportunities? In the story above, the opportunity was to share the gospel with a friend. That’s common, and we most certainly have many other opportunities to do good as well. Other versions declare it differently – redeem our time; make the most of your time – but perhaps there’s a hint of buying up our time in it as well, as opposed to stalling for time. Let us buy up every chance and opportunity we get to do God’s work. Let us find opportunities for Christ in the things that we do secularly. Let us live out God’s words even in the marketplace or even in campus. There are opportunities everywhere, if you would only open your eyes to look for them. And even if it’s something you are not used to doing, if the spirit prompts, do not reject it – do not put out the Spirit’s fire [1 Thes 5:19|Article]. Referring once again to the story above, there are some things in life that, once lost, is squandered forever. There are many opportunities that won’t come by us a second time. There are some opportunities that once we miss it, are lost to the world forever. Let us not dilly-dally our time away and find ourselves in that sort of a situation again and again. Let us use our time efficiently and carefully and diligently – not doing things in haste, though. There are some things that we need to wait for, and we must wait. But while waiting for those things, there are perhaps many other things we can do. There is a time for everything, and a season for every activity under heaven [Ecc 3:1|Article]. It takes wisdom to know what to do in a certain time. Be wise in the way you act toward outsiders; make the most of every opportunity [Col 4:5]. because the days are evil – evil lurks at every corner, for we live in a sinful world in a sinful age and in sinful times. And yet because of the prevalence of evil, because evil has permeated every corner, there is a greater need for the light of Christ to shine around everywhere. We’re fighting against time, plainly speaking. Why, you do not even know what will happen tomorrow. What is your life? You are a mist that appears for a little while and then vanishes. Instead, you ought to say, “If it is the Lord’s will, we will live and do this or that.” [James 4:14-15|Article] Let us be wise in these times of evil – Therefore the prudent keep quiet in such times, for the times are evil [Amos 5:13]. It takes wisdom to know when to speak, and it takes wisdom to know when it is no longer necessary to speak or to act. Even as we should make the most of our time and grab our opportunities, let us act with wisdom and for the good of God’s glory. Let us pray for wisdom to be discerning in the way we use our time. Let us pray that we will be sensitive to the opportunities that are around us, that we will grab them with sound judgement and not in foolish haste. Let us also make the most of our time and opportunities with a loving heart. There are many ways to do good, and some of these ways include a little bit of evil. Let us be wary of that, too. In 2 Timothy 2, Paul, knowing that his time of martyrdom is near, writes at length to his beloved son Timothy, in order to encourage the younger man to walk in the correct path as a leader and as a preacher. He especially quotes a ‘trustworthy saying’, out of which we are looking at the last of the 3 verses today. This verse speaks equally about the weakness of mankind and the greatness of the Lord – but we shall afford as little time as possible to discuss mankind, and instead focus our efforts on extolling the greatness of the Lord, which in this verse is manifested in one of his qualities – his faithfulness and his inability to disown himself. for he cannot disown himself – What does it mean to disown yourself? Can you disown yourself? Have you ever disowned yourself? In most translations the term is rendered, ‘deny’. God cannot deny himself. We get what it means, certainly – that God cannot deny his own qualities, his own personality, his own identity which makes him faithful even if we are faithless. He will not lie, because it is not his personality; he will not break a promise, because it is his quality to honor his words. But I prefer the word ‘disown’. It sounds more absolute to my inexperienced ears. “I cannot deny myself” sounds a tad arrogant and obnoxious, no? Like some little spoilt prince from a faraway country who always gets what he wants. God cannot disown himself – but we can. Have you ever betrayed your own principles? Have you ever gone against the morals which you believed in? Have you ever felt the pangs of your own guilty conscience? Have you ever done anything that would displease God? I have – surely you have too? We are faithless at times, we are capable of being faithless, because we are able to disown ourselves. And whether we are faithful or faithless, we do not change the fact that God remains faithful. What if some were unfaithful? Will their unfaithfulness nullify God’s faithfulness? Not at all! Let God be true, and every human being a liar [Rom 3:3-4]. What exactly does this faithlessness of ours – or this faithfulness of God refer to? It is important to note that the preceding verse had just said that if we disown him, he will also disown us [2 Tim 2:12] – Is that a contradiction? 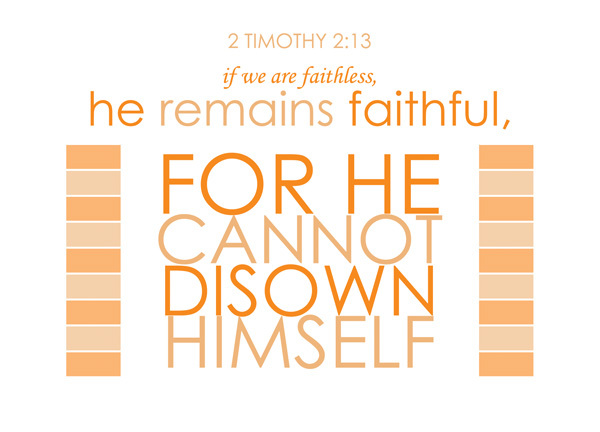 If we disown him, he will disown us, but if we are faithless, he will remain faithful? It is important here to note that while to disown God is a sign of our faithlessness, God disowning us who are unfaithful is not a sign of his faithlessness, but instead a sign of his faithfulness to his words. There is often a lot of confusion on this as there is so much evidence of God’s mercy and compassion for us in the Bible. If we find ourselves turning against God, or if we have trekked a path away from God, we are assured by the Bible that if we would only return to him, he too will return to us [Zech 1:3|Article]. Even as the prophets spoke at length about judgement and destruction, they also reminded us that the Lord’s mercies are new every morning [Lam 3:22-23].But as we continue to extol the Lord for his mercies, we often forget that the result of continued disobedience and persistent rejection of the Lord is destruction – The arrogant cannot stand in your presence. You hate all who do wrong; you destroy those who tell lies. The bloodthirsty and deceitful you, Lord, detest [Psalm 5:5-6]. We are all sinners, we all do wrong at some point or another – it is not wrong to assume that God will forgive us if we repent of our sins – but it is terribly wrong to assume that God’s forgiveness is reserved as well for us if we repent not and continue to dwell in sin, which he abhors. If we reject him, if we refuse to repent, if we deny him, if we disown him and continue to sin, God will keep to his word, he will still be faithful to his word, and he will, in accordance to his justice, disown us. If we are faithless, and if we disown God – i.e. we do not repent – there is only one way we can expect God to act, and that is to disown us. Do not expect any remaining mercy if you do not repent, for God is faithful to himself, to his own word, and the wrath that he has promised, he will exact. God’s faithfulness is absolute. His words are absolute. As mortals our faithfulness to our vows our promises and our own words are often dependent on the faithfulness of others. For example, in marriage. I’m neither married nor about to marry, and I do not even attempt to pretend I understand the complications and the pains involved in any marriage, just as I do not pretend to understand the joys and the satisfaction that many profess to possess in marriage. But often, all it takes to break one’s resolve to stand by his or her marriage vows, is the unfaithfulness of his or her spouse. All that it takes to break a ceasefire treaty, is to have a reckless soldier kill another in a drunken fit by the border. All that it takes to break a business partnership, is the signing of a second partnership of one party. It’s is absolutely practical. It was harsh of me to use these as analogies. It is certainly, by all standards of ours, absolutely insane if you still keep holding on the promise in these cases. Such is this sinful world. But our God is above and beyond all these. Above and beyond faithlessness. Ephesians Chapter 6 is the last chapter of the book, a small book written by Paul that’s perhaps very close to the hearts of many. It is a rather unique book, as while it was seemingly written to the churches in Ephesus, there was (uncharacteristically of Paul’s epistles to specified locations) no discussion about the area’s specific issues. Instead, much focus was placed on exalting Christ and the fullness of Christ, in whom each believer can gain richly from. This is the verse of transition between Paul’s exhortations from verses 1-9 and his ‘armor of God’ topic thereafter. We will hence look at the topic of being strong in the Lord with relevance to each of these two. Finally – Isn’t it interesting to note how ‘being strong in the Lord‘ was the final exhortation? It was the last thing that Paul urged, the one lesson that came after ‘finally’. In verses 1-9 Paul addressed people in different roles and urged them to be faithful and careful in the way they treat the main people they come into contact with in their respective roles. Having addressed these relations, and the duties and obligations that come along and are expected of them, Paul was equally aware that to be able to be up to tasks to these expectations and duties, the people need strength from the Lord. There are so many verses that speaks of strength and courage that it feels a bit like an over-visited topic. We know that our strength comes from God [Philippians 4:13|Article] – a strength that empowers us and enables us to move on and overcome our sufferings and our sins. Perhaps because it’s such an oft-visited topic that makes it even more crucial for us to understand it. We draw strength from the Lord. Why? How? When? 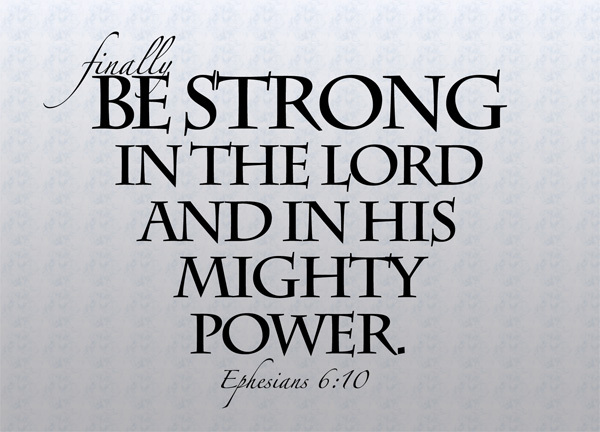 be strong in the Lord – What does it mean to be strong in the Lord? It could mean to be strong (and courageous) for the Kingdom’s cause. It could mean to acknowledge that we are weak and to depend on the Lord as our source of strength. Both could be right, and there could be many more interpretations of being strong. We face many mighty enemies, as Paul describes in verse 12 – For our struggle is not against flesh and blood, but against the rulers, against the authorities, against the powers of this dark world and against the spiritual forces of evil in the heavenly realms [Eph 6:12] – and hence we require the armor of God. By our own might we will certainly not prevail, for this is no physical war, and even the best physical weapons or armors will not be able to preserve us in it. We need to be on our guard, as it is a spiritual war, where only in God and through Christ can we claim victory. Be on your guard; stand firm in the faith; be courageous; be strong [1 Cor 16:13]. We need the full armor of God. Not just the helmet. Not just the shield. Not just the sword. Wear the full of armor of God, which brings you strength. That’s ‘how’. We’re not looking at the armor of God in detail today, but the passage from Ephesians 6:11-17 is very elaborate on it. In his mighty power – This answers ‘why’, I believe. Because God is mighty. It is a law of nature, that the weak depend on the strong, the weak draw strength from the strong, the weak gain courage from the strong, and the weak become stronger from all that. We do live in a world where many – not all, but certainly many – believe that the strong are meant to step on top of the weak. Nothing – absolutely nothing, as far as I am aware of – in the Bible preaches that. Even in the topic of faith, Paul has made it very clear that the strong should bear with the infirmities of the weak [Rom 15:1]. Our God is the same – He is strong, make no mistake about it, very very strong. But despite being strong, he is our refuge and strength, an ever-present help in trouble [Psalm 46:1]. All we need to do is to understand and believe that our God is mighty. There is no spiritual war where he cannot win. When we are fighting with the strength of the Lord, let us take heart in the fact that our Lord is great. Let us be empowered by God’s might and his incomparably great power for us who believe. That power is the same as the mighty strength [Ephesians 1:19]. When you are weak, when you are scared, when you feel lost and helpless, won’t you turn to God, seek strength in the Lord. Let God be your strength. Let us be strong in his mighty power by wearing the full armor of God. When are we weak? When will we be weak? Perhaps all the time. Even if we do not feel weak, in our daily roles, when we face our family, when we face our friends, when we face our colleagues, we need strength from God as well. Be strong not by your own strength, for it is insufficient; be strong not in others, for it is insufficient; but be strong in the Lord. From Romans 14, right up till the first few verses of Romans 15, Paul zones in on the degrees of faith and how one who is stronger in faith should treat one who is weaker in faith. ‘Weaker in faith’ – is a term that is very sensitive, perhaps. At a time when they were in a period of transition from the Mosaic Law to the Christian doctrine – not that the Christian doctrine has no laws, or that it is solely on grace – but the inclusion on newly converts – Gentiles – into the system led to a great many cultural differences that the Church had to accomodate for. In this study, we will examine what it means to be weaker or stronger in faith, and take a close look at some examples of disputable matters. Accept him whose faith is weak – What defines weak faith? In this context, it likely refers to those whose knowledge of the gospel are lacking, and hence stumbled along the way. It is not the faith in salvation; but likely refers to the person’s belief in other matters of the doctrine, which may be hard to understand, accept, or which may lead to controversy. In other words, they are Christians, who believe in God and follow Christ, but may not have a firmly established understanding of the doctrine, or maybe lacking spiritual knowledge and hence the ability to apply some of the word into their way of life. As human beings, it is perhaps natural to want to correct them, condemn them, reprimand them. We may want to use our own ways to educate them. As we get caught up with the magnitude of our knowledge in comparison to some of those around us, we may tend to be over eager to spit out what we know at them – without gentleness, without being sensitive, without the spirit’s prompting. Here, Paul says to accept them. Accepting them doesn’t mean that you subscribe to their theology or their understanding of the doctrine. Accepting them doesn’t mean to imitate them. Rather, accepting them is a perhaps a safeguard against ourselves, lest we go out there without gentleness and stumble people left right and centre. 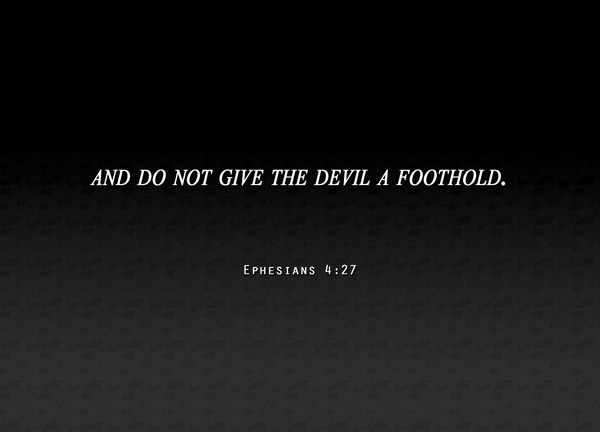 Be careful, however, that the exercise of your freedom does not become a stumbling block to the weak [1 Cor 8:9]. It is not always wrong to correct them, but let us have discernment on when and how we do it. Things that stumble people will always exist, but those who stumble others are in trouble [Luke 17:1, Matthew 18:7]. It’s one thing if you’re unable to lift others up. But it’s another thing in its entirety if you stumble others, even without intending to. Without passing judgement – And we come to the topic of judgement. Often when Christians who are perturbed by certain truths or theology go to others to voice their doubts, and we may be alarmed and harshly put them down as our most natural, first, immediate reaction. Let us be careful not to do that, for that often does nothing more than to confirm their doubts. You may win an argument against someone with a lesser understanding of the gospel, but without love and gentleness, we cannot expect to win them over. If in our mind we’ve already condemned them, then it is hard for love to enter the picture. Therefore let us stop passing judgment on one another. Instead, make up your mind not to put any stumbling block or obstacle in the way of a brother or sister [Rom 14:13]. on disputable matters – Matters of dispute? In the context of Romans 14 we’ll read about food. Can they eat everything? Yes- this is no longer the days of the Mosaic law where people are restricted from certain types of food. There are many laws in the Old Testament that have been abolished in the New Testament – but only if it’s clearly stated. The Old Testament is not only a historical text to us. Most of its laws still hold true to us. The context of food might not make much sense to you, but it does have great value in my life. Let me explain – born and raised in a Chinese society, most of my peers have relatives who, in accordance to Buddhist or Taoist religious customs, offer food to gods or ancestors; thereafter serving the same food for dinner. Can we eat those food? I’ve been brought up with a strict – no – as answer to that, and so far I’ve never knowingly eaten food that has first been offered to idols because most of my relatives around me already expect that Christians must not eat them, and Christian elders within the family are staunchly against it. Reading Romans 14 – I am convinced, being fully persuaded in the Lord Jesus, that nothing is unclean in itself. But if anyone regards something as unclean, then for that person it is unclean [Rom 14:14], 1 Cor 8 – But food does not bring us near to God; we are no worse if we do not eat, and no better if we do [1 Cor 8:8]; i hold the perspective that we can eat it even as Christians. If I am alone in a room, hungry, and there’s a plate of food that has been offered to idols, I will pray, and I will eat. Not everybody have agreed with my take on this. But do cut me some slack too – The one who eats everything must not treat with contempt the one who does not, and the one who does not eat everything must not judge the one who does, for God has accepted them [Rom 14:3]. The key here isn’t really about whether you eat or not, but whether there is love in your actions or not. Does this mean we do not talk about controversial topics, or leave a flawed theology without correction? I would think not. There are big, world-wide issues and many other seemingly smaller yet controversial issues that may stumble believers if not understood properly. Furthermore, if certain Bible passages are horribly misinterpreted, it could lead to acts of superstition and spreading of false teaching. What should we do, then? Accept them (not the ideas, but the people), yet speak to them and counsel them in gentleness and with love – do not expect a change in their mentality overnight, but keep praying for them and counseling them. Very easy to say. Let us pray for the discernment for ourselves. If we’re ever in the role of being stronger than others in faith, let us not stumble others by our lack of love and gentleness. We who are strong ought to bear with the failings of the weak and not to please ourselves [Romans 15:1]. If we’re ever in the role of being weaker than others in faith, let us not stumble others by our lack of understanding.